Necessity is still the mother of invention. Ask Lou Paradise, the developer of a topical cream called Topricin that soothes and relaxes tired and sore muscles as we rest. In 1965, Lou Paradise found himself pain ridden with severe bilateral Carpal Tunnel Syndrome (CTS).The condition was caused by injuries he sustained as a Marine Corps helicopter medivac crew chief during the Vietnam War. The physical demands of conducting hundreds of rescue missions of military personnel and Vietnamese citizens was too much for his body. Having an extensive background in physiology and natural medicine, Lou considered becoming a medical doctor with a focus on emergency care. In 1965--following two tours of active combat duty—he spent time in Hong Kong. There he met British- and Chinese-trained MDs, who introduced him to the potency of such traditional natural medicines as acupuncture, herbal medicine, and homeopathy—which are now known as complimentary and alternative medical (CAM) practices. Lou was impressed by their powerful healing potential and delved deeper into his studies. When Lou’s CTS was at its worst, he was lucky to get two or three hours of sleep, and had to rest sitting up in a chair to maintain circulation in his arms, hands, and fingers in order to offset the excruciating pain. Desperate for relief, Lou began to self-experiment by taking oral herbal medicines, which had little effect. Next he took single-ingredient homeopathic medicines but again had very little relief from his misery. Then he deduced that maybe a combination of homeopathic medicines delivered in a cream base and applied to the specific site of the pain might be the answer. This had never been done before. Blessed with a strong intuition, Lou experimented with select combinations of homeopathic medicines from the 3,000 different medicines available. Low and behold, he began to feel measurable improvement and in just a few weeks was able to get four hours of sleep, then five, then six. This is crucial to the healing process since the body does its primary repair while we are resting. Lou had no further need for oral pain relief medications, and was able to sleep in his own bed once more. 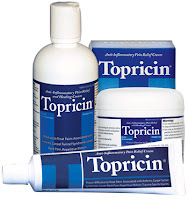 The prototype Topricin® formula was born! And after more than 25 years, Topricin has made it possible for Lou to be pain-free, symptom-free, and medication-free, enjoying a complete restoration of full function, mobility, and range of motion. “Sleep is crucial to the healing process, since the body does its primary repair while we are resting,” he says. He has been pain-free since 1981. When others learned about his discovery, he gave medication to them, and they did well, too. In 1992, he put his ideas into motion and two years later started his company. He called the ointment Topricin. In 2009, he adjusted the formula and created two new products: Topricin Foot Therapy Cream, specifically formulated to treat and help heal foot and ankle issues; and Topricin Junior, created to address the safety issues and concerns of parents and doctors in pediatric pain relief. He also saw how his product was helping patients with fibromyalgia. More than five million people — about 90 percent of them women — suffer from this syndrome, which is characterized by chronic, widespread pain in muscles, ligaments and tendons; multiple “tender points”; fatigue; and sleep disturbances. The causes of fibromyalgia are unknown, but there are probably a number of factors involved. Many people associate the development of this condition with a physically or emotionally stressful or traumatic event, such as an automobile accident. Some connect it to repetitive injuries. Others link it to an illness. For others, fibromyalgia seems to occur spontaneously. That’s where his ointment comes in. As a topical cream, it eliminates the need for pain medicines. “We’re not just treating the pain, we’re looking at the causes of the pain and offering pain relief based on healing, not just deadening symptoms,” he says. His proprietary concoction contains, among other elements, homeopathic arnica and Echinacea. It also contains four types of venom derivatives — which are not poisons, but highly concentrated digestive juices that help to excite the enzymes that promote healing. These ingredients are suspended in purified water and natural oil emulsions that protect and moisturize the skin, rather than in petroleum and paraben bases, which are linked to other health concerns.